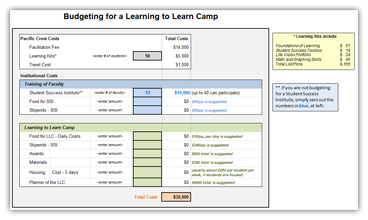 What is the typical cost of a week-long Learning to Learn Camp? Note: A stipend for mentors and coaches is not generally recommended but may be a necessary cost for some institutions. In some instances, CEUs or graduate credits have been the benefit for involvement in a camp. Depending on the options you select, the cost of a Learning to Learn Camp can vary widely. We invite you to download and use the spreadsheet below to help you "run the numbers" for budgeting purposes. If you have any questions about costs, please don't hesitate to contact us.